There was a time in America when US pocket change consisted of precious gold and silver metal. And while gold coins haven’t circulated in commerce in quite some time, silver was used in spare change as late as 1970. As such, these coins are unique since they are US legal tender that actually circulated among the general population before being hoarded. Tube of 20 Kennedy Half Dollars, dating from 1965-1970. Coins are 40% pure silver. Before 1965, the US half dollar consisted of 90% silver. Due to the rising price of silver, 1965 Kennedy half dollars were minted with only 40% silver instead of 90%. 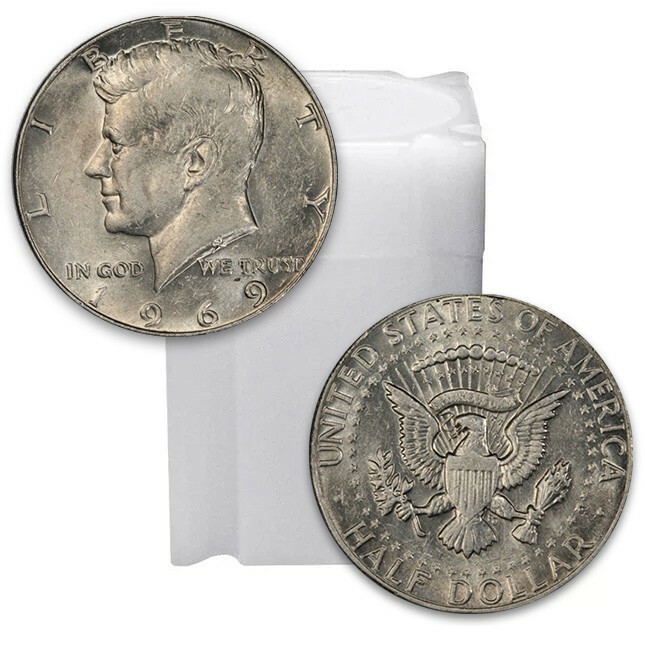 This silver content remained the same until 1970, when the price of silver had risen so much that silver was completely eliminated from the Kennedy Half Dollar altogether. Half dollars and other types of old US Silver Coinage are typically held in case of an emergency. A passionate group of investors believe that in an currency crisis situation or emergency banking holiday, original US pocket change that contains silver will be extremely useful. The coins could be taken to a local coin dealer and sold for the metal content (if the banking system were on holiday). If the situation is particularly bad, this junk coinage might be able to be used in trade directly (aka barter). Other fractional silver rounds can serve this same purpose. The Kennedy Half Dollar was first struck in 1964 in honor of the slain President. One side features the left hand portrait of the President. On the other is the American Eagle and Shield design. The Eagle clutches in its talons the olive branch and bunch of arrows, symbolizing peace and war respectively. The words “UNITED STATES OF AMERICA” and “HALF DOLLAR” are stamped onto the coin. All shipments from Monument Metals are insured fully and all products are guaranteed as described. I've ordered 8 tubes of 20 so far. The price is at spot. $0% or not, silver is silver. Delivered to my hand, free in plastic tubes. Great deal. Just 49c Per Oz Over Spot!